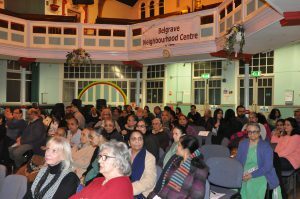 A few pictures from the ‘Not-Quite Bollywood’ evening at the Belgrave Neighbourhood Centre, where different generations of South Asians with their family gathered to socialize and watch the free screening of Queen (the story of a Punjabi girl, who after being ‘abandoned at the alter’ by her fiance, decides to go on a pre-planned honeymoon to Paris and Amsterdam by herself). The event had a great turnout of about 100 people, who following the event, inquired about such future events. 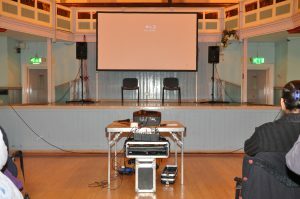 Following the event, the participants were requested to provide feedback on the event, the screening and their availability to be contacted for future events and research interviews. Many of the respondents provided their contact details and agreed to be part of this research. Such an approach helped me to build a list of names (which will be stored in a database) for future events, to keep them abreast of forthcoming screenings of Indian cinema. 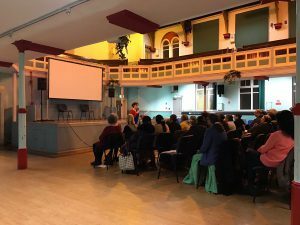 Some of the participants, provided their contacts which will prove to be useful, to gather further historical knowledge on the cinema-going experience of this community, before the closure of South Asian Cinemas in the area. 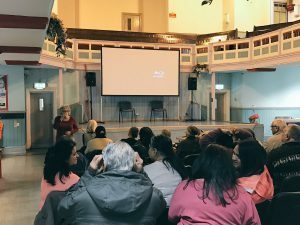 Informal conversation revealed that the screening at the Centre provided them an unusual, and yet pleasant and familiar experience, which they wish to have again. The promotion for the event occurred through flyers and online social media initially. 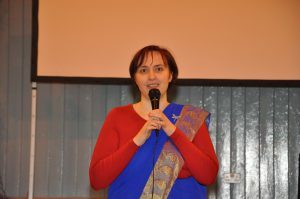 However, the physical engagement with the community and participation to their cultural events provided the opportunity for face-to-face conversations and direct word-of-mouth promotion of the event. 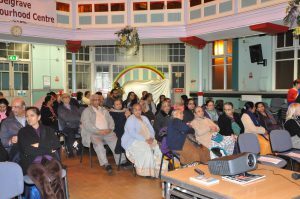 The night before the screening event, promotion during the India’s Republic Day celebrations from the Gujarat Hindu Association proved to be essential for building awareness of the screening of “Queen” event and establishing a relationship with the community. 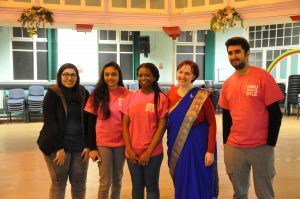 This event was possible thanks to: De Montfort University, DMULocal, DMU Square Mile India, DMULocal Volunteers, CATH Research Centre, Belgrave Neighborhood Centre, the South Asian community in Leicester (the audience), and the support of: the Gujurat Hindu Association.